January 19, 2018 | by Debra Wood, R.N. Whether it means partnering with other organizations, finding new ways to serve and advocate for vulnerable people, or supporting community-minded residents who want to serve others, nonprofit aging-services providers can have tremendous social impact. In a country with many unmet needs, LeadingAge members are reaching beyond their walls into their greater communities to serve as a catalyst to better support an aging America and to ensure justice for older people. Here’s the story of some organizations and their residents who are making a difference. Approximately 10% of older adults suffer from abuse and neglect, but it is often underreported, because elders may fear retaliation or that the abuser might get into trouble, according to the National Center on Elder Abuse. Photo courtesy of RiverSpring Health. While working as a prosecutor, Solomon saw that older people needing emergency shelter did not have options, particularly male victims. Later at a nonprofit justice center, she discussed that need with Daniel Reingold, president and CEO of RiverSpring Health, while both were attending an unrelated meeting. “Reingold said, ‘We could do that at the Hebrew Home,’” Solomon says. Solomon and Reingold applied for grant funding and the elder abuse shelter at Hebrew Home opened in 2005, initially in one location on campus. Now, victims are placed in the most appropriate level of care based on medical needs, as the Weinberg team provides legal and other services to help the person get back home safely. All visitors come through one point of entry, and security knows who can have resident-approved visitors. Elder abuse victims and others can request certain people not enter the campus. For the first 2 weeks, elder abuse victims can have no visitors as the justice center team assesses the situation. Solomon raises awareness of elder abuse issue and educates health and law enforcement professionals, doormen, meals-on-wheels volunteers and older adults. She also delivers presentations at conferences, including LeadingAge’s annual meetings. The Center for Elder Justice also uses social media to raise awareness and sponsors symposiums. “Any way we can be, we are out in the community,” Solomon says. Last year, 19 clients came into the shelter, including those referred through adult protective services. In addition, employees of Hebrew Home screen patients who come into the home’s subacute unit. Solomon explains that if abuse is happening, it is going to affect an older adult’s health. Employees throughout the campus are more aware of elder abuse. “The shelter has changed the culture on campus,” Solomon said. That has led to a domestic violence program for employees. Knowing elder abuse was a national, not only a regional, concern, Solomon and the Weinberg Center developed the SPRiNG Alliance - Shelter Partners Regional, National, & Global. The Alliance is a coalition to create a network of centers throughout the country. Solomon talks about the model and educates long-term care providers about the need for shelters. Members of the SPRiNG Alliance meet monthly by telephone. Speakers address common issues. Members support each other and meet each year in a different location, so people have the opportunity to see other shelters. Another LeadingAge member, Jewish Home Family in Rockleigh, NJ, also identified a community need—that abused older adults had nowhere to go. Carol Silver Elliott, president and CEO of the Jewish Home Family, opened its center, SeniorHaven, in 2015. “There was a feeling that this was imperative for us to do,” Elliott says. Jewish Home Family follows the Weinberg Center’s protocols. When the organization receives a referral for the shelter, a team will review and decide if it is a shelter case. About 3 or 4 victims arrive annually. Victims are admitted to the nursing home or assisted living for a stay of 90 to 120 days at no charge. The organization will bill Medicare or Medicaid if the person qualifies. The medical director provides care at no charge. The ambulance company and pharmaceutical company also do not bill these residents. Jewish Home Family helps the victim find new housing or other services, so they have the answer that is right for them. During the first 2 weeks, the victims do not have telephones in their rooms to prevent contact with the abuser. There are no name tags on the doors or at the front desk. While providing older adults suffering from abuse a safe place to stay, Elliott calls it equally important to educate the professional and lay communities about what to look for, signs and where to go with concerns. That outreach effort includes going to first responders, adult protective services, hospital discharge planners, emergency department staff, and senior centers. At senior centers, members often tell her they know someone suffering abuse. Elliott indicates she deals with societal beliefs that older adults cannot speak for themselves. Health care providers will direct questions to the caregiver rather than the older adult. She works to overcome misperceptions people have about older people. “That is part of the uphill battle, talking about elder abuse,” Elliott says. People are embarrassed or fearful. 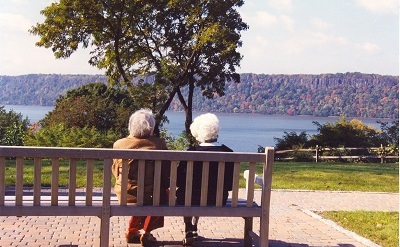 Older adults often do not want to leave their home. Elliott serves on the New Jersey Task Force on the Abuse of Elders and Disabled Persons, and she orchestrated a theater event at LeadingAge New Jersey’s annual meeting, during which people read the words of a victim to recognize World Elder Abuse Awareness Day. Residents of the life plan community Kendal at Longwood in Kennett Square, PA, had long enjoyed concerts by the Chester Children's Chorus and supported the organization. 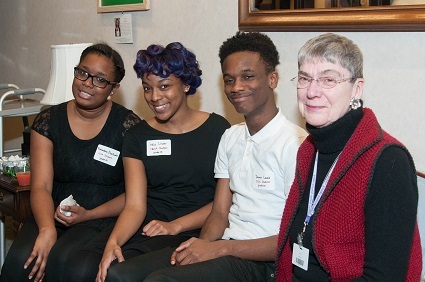 About 5 years ago, says Peggy Brick (a Kendal resident), the leader of the chorus, John Alston, created the Chester Charter School for the Arts in Chester, which has more than 80% of children living below the federal poverty line. Charter School for the Arts. Photo courtesy of Kendal at Longwood. The school serves 650 children in grades K through 12, about 10% of the city’s school-age population. Reading has improved tremendously, with 85% of first graders reading at grade level, compared to 25% when the school opened. Last year, the school moved to a new building and location. The children thanked the residents for their support with an art display at Kendal and a recital. “It is open, and it’s a miracle to walk into [the school],” Brick says. Eagle County, CO, pulled together a public-private partnership with Augustana Care of Minneapolis, MN, to build the $24 million Castle Peak Senior Care and Rehabilitation in Eagle, providing assisted living, memory care, rehabilitation and skilled nursing care. Prior to its opening, far too often, older adults had to move more than 100 miles away to receive such services. In 2010, the Eagle County board of county commissioners decided to make building such a center a priority and did a search to find a provider. Finalists had to have a good track record caring for older adults, a good fit with the community, and patience and persistence through the governmental process. “We found all of that and more with Augustana Care,” says Jill Klosterman, previous director of housing for the Eagle County Housing and Development Authority in Eagle. Members of the Eagle County team visited Augustana Care properties and observed how leadership interacted with residents. “We could tell the residents were important to Augustana Care,” Klosterman says. Kay Gudmestad, vice president of philanthropy at Augustana Care, says Castle Peak meshed with its goals, because it was an underserved community, which fits into Augustana’s mission to foster fullness of life for older adults through housing, health care and community-based services in the Christian tradition. Additionally, the organization wanted to branch out from Minnesota. “There were a number of hurdles we overcame together and developed relationships in the process,” Gudmestad says. The housing authority purchased the land and donated it to Castle Peak and made a loan to the project to get it started. Every municipality in the county contributed to the development of the project, totaling nearly $1.5 million. Augustana Care raised additional funds through a capital campaign. It also formed an advisory committee to learn more about the community’s needs. The local newspaper helped tell the story about Castle Peak, which served 103 people in its first year. Both partners recommend any organization thinking of doing something similar should take pains to pick a good partner, get to know each other and the cultural aspects of the community, and not assume things will be the same as in other existing communities. Castle Peak has had to train many of its workers in caring for people with memory loss. Staffing is a challenge, with unemployment at 1.2% in the upscale county. Augustana Care brought in professional staff from Minnesota. The organization also formed a partnership with the local community college to train nursing assistants. Debra Wood, R.N., is a writer who lives in Orlando, FL.